How many of you have been to a concert like this: Everything is real, but the pop star on stage is not because she is a hologram? This sounds like a prophetic story from Black Mirror, doesn’t it? Except, it’s not. It’s happening right now. Some of you might know Hatsune Miku as a holographic star from Japan, known for her iconic pigtails that almost reach the ground. Miku can sing in English, Chinese, Taiwanese and perhaps in Italian, always with funny and cute accent. In fact, back in 2007 she was initially created as an anthropomorphized mascot for a virtual singing software by a Japanese technology company, called Crypton Future Media (CFM). When Hiroyuki Itoh founded CFM in 1995, he focused on doing business related to “sound”: they import, develop and sell virtual instrument software and sound materials to professional producers. In 2003 YAMAHA unveiled a human voice generating technology VOCALOID. Itoh stated, “We knew that such technology existed, and wondered if there was anything we could do with that.” So, Itoh obtained a license from YAMAHA and created the first virtual singing software in 2004; he called it “Meiko”. In Japan, voice synthesis software was reasonably popular, and it was used to generate broadcast for train station, answering system for telephone company and so on, it was used to speak, not to sing. Itoh wasn’t sure about whether the need existed for such software (to make a computer sing) or what benefits there might be in producing it. In fact, he was pretty UNCERTAIN about the entire venture. This uncertainty guided Itoh for an experimental step: he didn’t just create a singing software but also attached a cartoon character with it. “I did that because a software that simulates a person singing is not an essential need to human beings. I figured, in order for it to appeal to people and be loved by people, it needed to have a human touch, and something like a cartoon character was the right tool for that.” In Japanese culture, it’s common for companies or organizations to use mascot or cartoon character to represent their brand and use it for marketing and communication purpose. CFM had learned important lessons from the small success of Meiko. That led to the creation of Hatsune Miku and their exponential growth. When the music package “Hatsune Miku” was released in 2007, CFM’s software business took off quickly. Within the first month of its release 10K units were sold. Within 10 years 120K software units were sold and it remains the best seller…even now. Furthermore, CFM’s business model has evolved: it has become a music technology company that helps creators use their software to create music and sell music. How did it happen and what is driving the exponential growth? An easy-to-use software reducing barrier of music creation and solving higher value jobs: CFM’s product was targeting to professional producers, such as song and lyrics writers, music composers, audio engineers etc., who create sound or music for commercial purpose. Without Miku, they would have to hire real, human singers in order to get the tunes correct. However, with Hatsune Miku (the software) they can create songs with human singing voice quickly with lower cost. 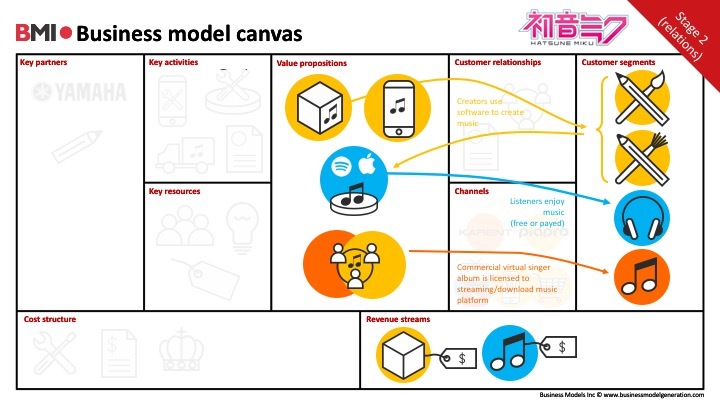 A co-creation platform protected by rules to form a healthy chain of creation for quality work: CFM operates a platform Piapro (pun on peer production) that allows creators to share and co-create works of Hatsune Miku. In Japanese culture “secondary creativity” is deeply rooted: when fans adore a character from anime series or manga comic, video game etc., they engage further by making new iterations or variations of their own. And this culture similar to what we know as co-creation. Moreover, in order to encourage this chain of creation while protecting quality work, CFM established the rule “Piapro Character License (PCL)” to ensure the non-commercial and commercial use of co-created content are made easy and possible, whether it’s producer-generated-content or user-recreated content via multiple iterations. This approach is significantly different from any other company that applies conventional copyright licensing. With Piapro co-creation platform and PCL creative common license, Hatsune Miku is crowdsourced by numerous pieces of content, including illustration, music, lyrics and 3D Models, and more. 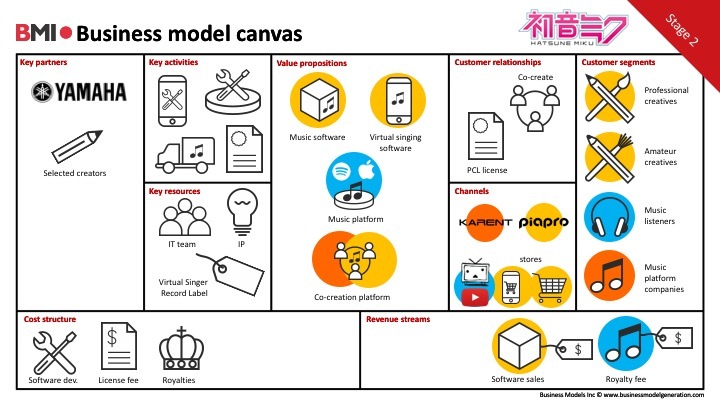 The “chain of creation” invited more and unexpected customer segment, such as amateur creators and more listeners: the variety of work published on Piapro and video sharing platform, such as YouTube and Niconico, has drawn the interest of amateur creators and people who have never heard of Miku. They have even used CFM’s software to create iterations based on other people’s work (e.g. same song in different language)) and have used user-generated free animation software (MikuMikuDance) to create dances for her. In fact, these fans are very creative: a few fans saw one of Miku’s music video in which she plays a fictitious keyboard-guitar like instrument. These fans took snapshots from the screen, blueprinted it, and built it. Now it’s a real instrument. If you do a simple search, you will find 4.7 million results on YouTube; and it’s still growing. Amazingly most of the work is done by creators instead of CFM, who remains a relatively small team. Music as common language for cross-culture: you can say Hatsune Miku is Japanese, but she learns new languages quickly. Through her fans/creators she can sing and speak in English, Chinese, and Taiwanese, all with a Japanese accent. One of Miku’s most well-known songs, “Loituma girl / Leekspin“, is actually a 27 secs fraction of Finnish folk song “Levan Polkka”. When her fans released this as a Flash music animation in 2006, it went viral on YouTube in Asia and the traffic even led back to the origin Finnish quartet Loituma– which brought the group renewed fame. Miku’s fans have made her singing famous Taiwanese songs and you can even find her singing in Dutch, Italian and many other variations with her cute accent. 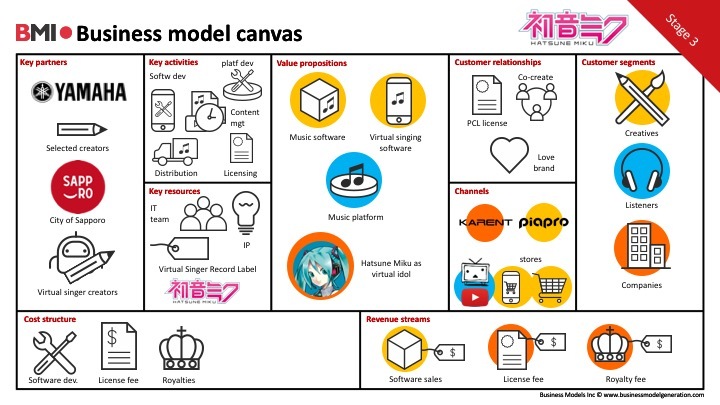 A Record label for virtual idols and new revenue stream: CFM operates KARENT, a record label only for music sung by Vocaloid characters; Miku is one of them. KARENT distributes and publishes music for creators to various music platform such as iTunes, Amazon, KKBOX, Spotify, and others so that listeners can find the music just about anywhere. As of today, there are 20 Vocaloid characters on KARENT. And, Miku alone has already released 900+ albums, 3000+ songs and 30+ movies! With this, KARENT has become the largest Vocaloid record label in the world. Unlike the other human idol or flesh-and-blood divas, Hatsune Miku was created with a fairly simple configuration such that creators and fans have plenty space for their creativity: They get to define her characteristics, give her rich stories, and make her sing and dance in different ways. Miku’s fans form a strong network of prosumers: they create her, nurture her and worship her. Miku is no longer a marketing ploy, she is a powerful co-creation platform. As the name “Hatsune Miku” becomes more popular, her work is no longer limited to music, illustration and animation. You can find Miku figurines, Miku biscuits (with QR code linked to her online music), Miku arcade games, Miku comic books etc. Moreover, corporations and brands have enlisted Hatsune Miku as their brand ambassador and have even co-branded with Hatsune Miku. For example, Xiaomi, a Chinese company, co-branded a limited edition Miku smartphone. Toyota hired Miku to endorse the Corolla in an advertisement. In fact, both classic and chic fashion brands are doing crossovers with Miku. Miku has also become the best spokesperson for the city of Sapporo, where her father’s company, CFM, was founded. And, she’s only becoming more popular as she tours in Japan, the US, Singapore, Taiwan, China, and other countries. Hatsune Miku has become a famous holographic pop star who has 2.5 million Facebook followers and 500,000 subscribers on YouTube. Her business model continues to evolve by moving from 2-dimentions to a 3-dimensional world. She is clearly challenging the status quo of entertainment and media industry. What’s next for Hatsune Miku? 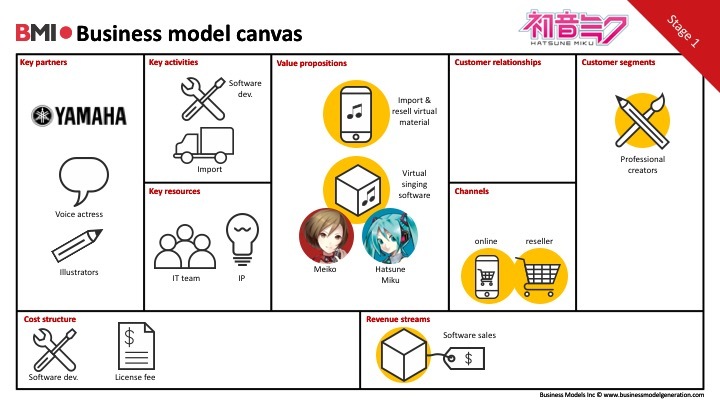 Hatsune Miku’s business model is driven mainly by the principle “community of fans” and it’s full of possibilities. Interestingly enough, Miku is a virtual idol with human parts but she transcends human limitations. She doesn’t need to catch the next flight to move from Sapporo to Taipei. She can teleport to Taiwan for her concert and be “home”, in Japan a few minutes later. Although it seems there are very few physical limitations that stops Miku from growing exponentially, CFM takes good care of Hatsune Miku by working with selected client companies for different experiments under the PCL license to ensure original creators can obtain respect and royalty while the quality of derivative work remains.